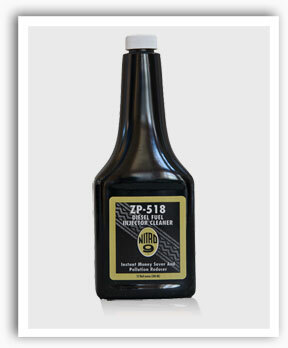 ZP-518 Diesel Fuel Injector Cleaner is formulated for hard baked-on deposits created by the high heat of the diesel engine. It will soften, clean and disperse carbon, varnish and gum from fuel system and combustion chamber. Components include throttle body, cylinder heads, liners, rings, valve stems and fuel injectors. How It Works: For cars, apply one 12-ounce (360ml) container to fuel tank after reducing fuel level to 1/4 to 1/3 tank or no more than 5 gallons (20 liters). For tractor-trailer trucks use 25 ounces (960ml) for every five gallons (20 liters) remaining in the fuel tank. Operate engine for a minimum of one hour or until fuel tank is almost empty. You may now top the tank with fuel. Some engines run on low quality fuels may require another treatment. The remaining ZP-518 Diesel Fuel Injector Cleaner in the tank will provide a measure of protection from gum, carbon and varnish from leaving new deposits. It is at this time that ZP-500 Fuel Treatment should be added and at every 1500 miles (2400 kilometers) to maintain the pristine condition that the ZP-518 Diesel Fuel Injector Cleaner has accomplished. What To Expect: ZP-518 Diesel Fuel Injector Cleaner contains Vacclaisocryptene, an intense pressure sub-surface lubricant that penetrates the metal 3-4 mils. It will easily go through gum, varnish and carbon. The engine’s horsepower, idling, emissions, and fuel efficiency will improve after one application. Cylinder head compression will increase. Some engines that have not had the benefit of a regular maintenance program have shown an even larger increase in compression. To determine this, note compression before application and again after use. Technical: Liquid - Amber Color - Combustible - 142° Flash Point - Reactivity Stable - Harmful if Ingested.